Today the professional action starts at the 2019 running of the NHRA Lucas Oil Winternationals. The 1985 race had all kinds of awesome action and was contested under cool, murky Southern California skies. This weekend at the race we’ll be racing under similarly murky conditions during part of the weekend and the temperatures are going to be cool, crazy cool and that should mean crazy fast on the race track. Below we have the clipped finals from the three professional categories at the race. Pro stock, funny car, and top fuel. The funny car final was the showstopper of the race. Massachusetts based racer Al Segrini was taking on California legend Dale Pulde. 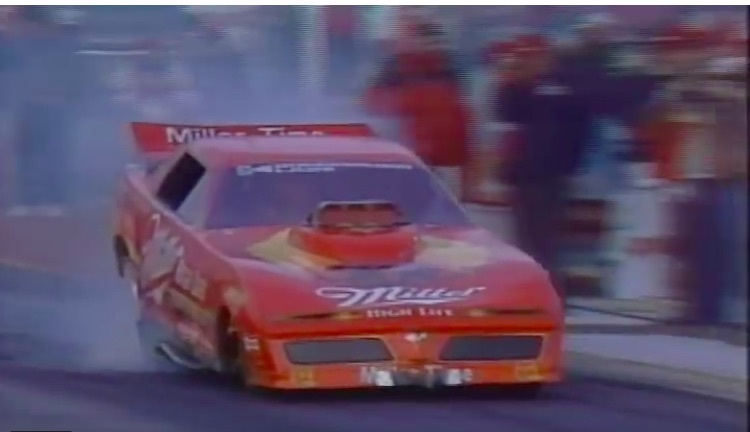 Segrini was driving the funny car of Joe Pisano and as we’re friendly with Segrini we have heard the inside story of this run. As Al told us, he knew that something was wrong with the clutch by the time he was done with the burnout. Back in the days before radios, the driver was in full control of what happened next. Not wanting to concede the run to Pulde and understanding that there would be consequences to his actions in going down the track, Al sat low in the seat and wait for the stuff to hit the fan. How did it go? Watch and find out. BangShift Question Of The Day: What Kind Of Hot-Rodded Van Would Work For You? Road Racing Video: Watch This 3.0L Ford Capri Carve Up Goodwood, Camaros And All! War Eagle! Pro stock Cars that you can tell what they were, and a diverse group. Compare to the new Winternational pics. I was at the 85 event, won’t be for this years too blah.